Every neighborhood in Oakland with a “mont” in its name has bedrock exposed. Crestmont is a good example. 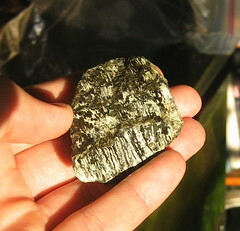 Most of the Crestmont neighborhood, north of Redwood Road and east of Holy Names University, sits on serpentine rockmore precisely, serpentinite. This is the biggest exposure, at the intersection of Crestmont Drive and Westfield Way. Below is an exposure just to the north (click full size), which is somewhat bluer than the blue-green of the main patch. 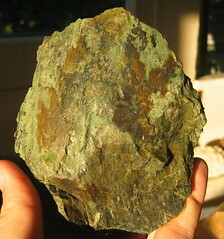 I’ve shown pieces of this rock to local geologists, asking them “Is this serpentinite or blueschist?” They usually say “Beats me” or, even better, “Yes.” These rocks are not easily assessed by just eyeballing them. This entry was posted on 20 August 2008 at 10:01 pm and is filed under Oakland blueschist, Oakland serpentinite. You can follow any responses to this entry through the RSS 2.0 feed. You can leave a response, or trackback from your own site. I’ve noticed when driving around a lot of the serp exposures in road cuts on small roads (around Cloverdale in particular) that there is a lot of creep and other mass wastings in this stuff, is there any particular problem in this location with such effects? I ask becuase people are footing thier houses in it. The serpentine here is fresh rock, exposed when the land was developed, so I didn’t notice any deterioration . . . yet. On the other hand, my very first post showed deterioration of this same serpentinite. 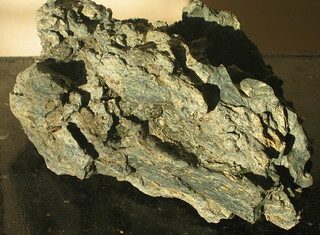 Serpentinite weathers rapidly and is a lousy material to build a house on. If you ever drive into the mountains behind New Idria you will see roads carved into a huge body of serpentine – the worst roads I’ve ever seen in California. When it rains it’s like driving on toothpaste. Fortunately I’ve visited New Idria (twice now) only in the dry season. But those are dirt roads. Marin County has plenty of serpentinite but its paved roads seem to be OKequally prone to slumping, I meanon all kinds of rock. Maybe they just keep up their roads well. 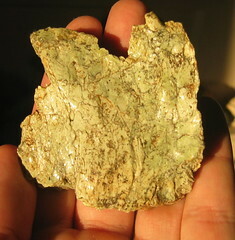 By the way, I have a gallery of serpentinite on my About.com site; in fact I’ll be adding a picture of bastite to it today. It makes me happy beyond measure that other people keep their eyes out for serpentinite. I tend to collect it here and there, pretty specimens I’ve found out and about, and photographically, with my favorite Oakland example being the big boulder at Serpentine Prairie. Excellent, Mary. That’s the same body of serpentinite, just over the city line on the other side of the ridge. Now I must visit there. 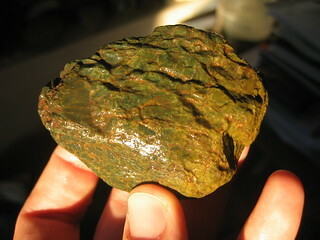 is a very craggy serpentinite I found up near the prairie that Mary mentions, but in the median of the roadway. I wonder why it has such a funny shape? The next one is one with bands. I am not 100% sure it is serpentinite. Please let me know what you think about each. Todd, your first photo shows a typical blueschist from that serpentinite belt. I call it blueschist not because I’ve checked it out under the microscope but just to differentiate it from the slippery-looking serpentine rock. I have a piece from nearby that is full of holes. All I can think is that there was another mineral, perhaps talc, that has weathered away from around and inside it. The second striped stone is hard to tell from the photo. Serpentinite has great variety. I have a fat book of research papers on serpentinite that I’m partway through; we have a lot to learn still.